Summary resumes will not be acceptable for our purposes. Only chronological resumes will be accepted. 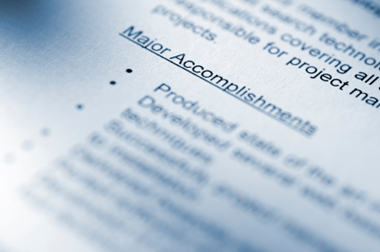 Resumes should be kept to one page if possible. Under no circumstances should they be over two pages. The type should be no smaller than 11, and the margins should be no less than half an inch. Be sure your name and address are at the top and centered, along with the phone numbers you can be reached at (home and work if possible). Your education should come next. It is usually listed in order of importance. If you have a Master's or Ph.D. degree, it is listed first, then Bachelors degree. If you have more than one degree, then the one received the latest is listed first. We prefer the dates of completion to be included with each degree. If you do not have a degree, then High School needs to be listed, including when the diploma was received. Also, some of your more important training classes can be listed at the top if you are non-degreed, but only the relevant classes. If you have worked towards a Bachelor's degree but have not completed it, please note that, including how much as been completed or how much is remaining. Do the same for Master's degrees. After education comes job experience, with your current or most recent job listed first. As far as listing your work experiences, it should include your company name and city, state, and your starting and ending dates (month and year). Job titles should be listed from current to past, and after title should come the description of what you have done in that position. 4) General description of your duties, daily activities, and accomplishments. If you have worked several positions within the same company they should all come under the same company heading but with the separate titles with the dates that each position was worked and a separate description for each position. After listing all employers, titles, and descriptions, be sure to note if you have had any relevant experience during college. Note that the position was held during college, and if it is relevant to your current career choice it should include a very brief description. Military experience should also be noted, including years of service and rank upon discharge. A brief description can be included if you feel it is relevant to your training or if that is where any supervisory experience took place. Generally activities and hobbies do not need to be on a resume. Be sure at the end to note that references will be furnished upon request. » Please click here to see the example if you have any questions.